In the fourth part of the Pawanmuktasana Series 1 (Anti-Rheumatic sequence), asanas that concern the wrists and hands, have been given. The hand and wrist exercises relieve tension caused by prolonged writing and typing and hence are very good for the office people and students. The practice can be easily performed either at home or at the office desk and in any order. It also won’t take much of your time but will yield great benefits. Sit in any comfortable pose but with the spine in an upright position. Stretch out both the arms straight in front of the body at shoulder level. Open the hands and stretch all the fingers as wide apart as possible. Make a tight fist by closing all the fingers keeping the thumbs inside. Open the hands and stretch all the fingers again. The awareness during the exercise should be on the stretching between the fingers and other impacts that can be felt on the body. Sit in the comfortable pose with the spine in the upright position. Stretch out both the arms in front of the body at shoulder level. 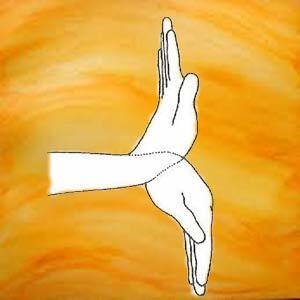 Open the hands and make the palm flat with the fingers straight. Keep the palms open and fingers straight throughout the practice. Bend the hands backward from the wrists with the fingers pointing toward the ceiling. The idea should be as if you are pressing the palms against a wall. Bend the hands forward from the wrists so that the fingers point toward the floor. 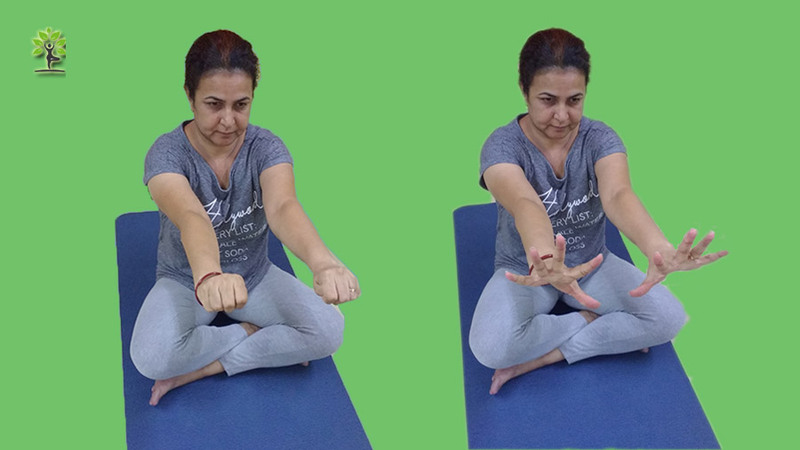 Repeat the process by bending the hands backward and then forward with the fingers pointing up towards the ceiling and then towards the floor respectively. Repeat the process 5 to 7 times. Maintain the awareness at the wrist joint, stretches of the forearm muscles and the resulting impact on the shoulders and upper back. Clench both the fists with the thumbs inside. Rotate the fists together in opposite directions. Make 5 to 7 rotations. 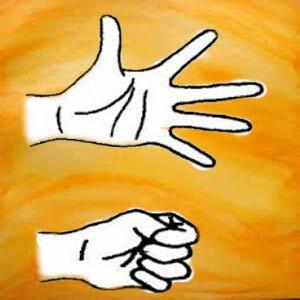 Rotate fists 5 to 7 times in opposite direction i.e. 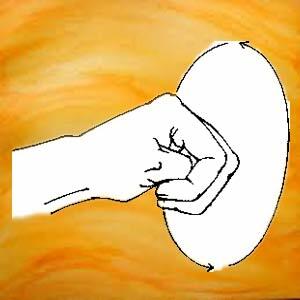 if the right fist moved in clockwise direction earlier, then next time it will move in the anti-clockwise direction. The left fist will, therefore, move first in the anti-clockwise direction and then in the clockwise direction. Sit with the eyes closed and become aware of the natural breath and then the wrist joint. The hand and wrist asanas encourage flexibility and circulation to the fingers, hands, and arms. These exercises strengthen the muscles of the wrists, arms, shoulders, and back. They relieve tension caused by prolonged writing and typing.